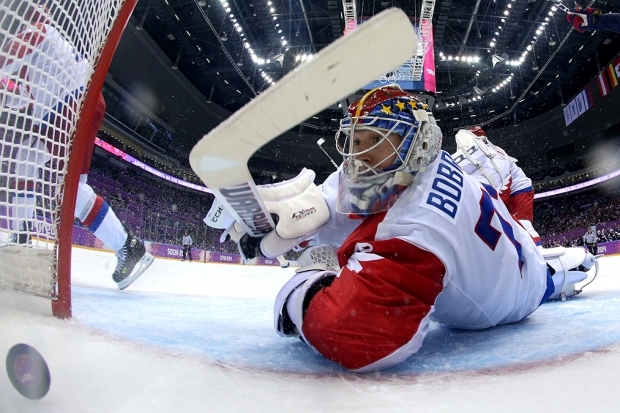 Team USA defeated Russia 3-2 in an exciting overtime penalty shootout in Sochi on Saturday. Forward T.J. Oshie was a standout in the shootout, scoring four goals out of six shots, instantly becoming the face of the team. Fans took to social media to celebrate the big win and Oshie's scoring against Russian goalie Sergei Bobrovsky. A shootout specialist who was chosen for the U.S. men's hockey team with just such a situation in mind, the 27-year-old from Warroad, Minn., gained a massive Twitter following soon after the game finished. At 10:22 am ET, he had 92,000 Twitter followers and an hour later that number reached 131,000, according to NBC Sports. WATCH: T.J. Oshie Plays Hero in Shootout for U.S.
"I think you're going to see T.J. Oshie become a household name after that display he put on," David Backes, Oshie's teammate in St. Louis, told The Associated Press. "The kids will be out on the pond probably in Minnesota right now, throwing a 5-hole on the goalie three or four times in a row." The White House also sent out a congratulatory tweet after the game. The "-bo" at the end signifies that President Barack Obama sent it out himself. So what did Oshie think about the president tweeting about his performance? "I did hear that and got a little nervous and lost my breath a little bit," Oshie told NBC's Dan Patrick.